Peace of mind for kids while in snake country. Penetration tested to ASTM-1342-05 standards. 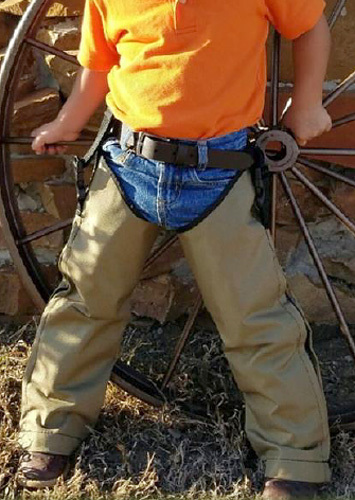 Childrens snake chaps are sized by measuring around the largest part of his/her calf and thigh while wearing the same type of pants he/she would wear outdoors. See sizing chart. Just like adults who wear snake chaps, children should wear sturdy boots or thick shoes so snake fangs cannot penetrate foot area.